We had a major problem in our kitchen in 2007. Our dishwasher hose started leaking water and before we knew what was happening, the floating timber floor had a cushion of water under it. We claimed on our insurance and to make a long story short, had to have everything in the kitchen removed to dry out the flooring, then, when they realised that wasn't going to happen, the flooring was replaced and everything put back, including the cupboards. They had to replace the bench tops too because when the cupboards were taken out the bench tops split. Great news, we had a new floor and bench tops, but the truth of it was that we were without a kitchen for a week and it was a major inconvenience. However, I always try to mine even the smallest piece of gold from every disaster. When we moved everything back in, I rearranged the way I used my kitchen. When we first moved into this beautiful home of ours, I was working outside the home, so the kitchen was set up for quick meals and teenage boys. Over the years I'd changed a few things to better suit how I worked, but when we put back the contents of our cupboards I thought about how I wanted the kitchen to work and made more changes. The large sliding drawers under the stove now hold all the plates and bowls we use every day; they used to house the saucepans. Now I can easily take a plate from a drawer as I'm cooking and the saucepans, that are needed much less often than the plates and bowls, are in a cupboard. Now my electric kettle is sitting with my tea canister, a little cupboard just above them holds instant coffee and different types of tea, the cupboard next to that holds the tea cups and coffee mugs. The zone is right beside the sink so the water is close. The toaster and bread bin are close together, next to the sandwich toaster. My pantry and fridge are at the end of my main work bench. 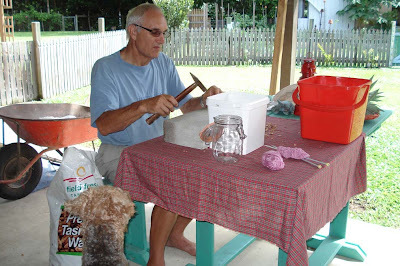 The pantry holds my bread flour, sugar and salt, the fridge holds the yeast and butter, so when I'm making up my bread dough, I just move from the bench to the end of the bench and for that small job, everything is within my reach. They say the best design for a kitchen is to have the stove, fridge and sink in a work triangle where each side of the triangle is no more than 9 feet and no less than 4 feet. We do have that work triangle configuration in our kitchen but having areas broken up into smaller working zones works better for me. I wonder if it would help you too. Our kitchens are probably our main work area, we work in there a few times each day, often much more, depending on the size of the family. 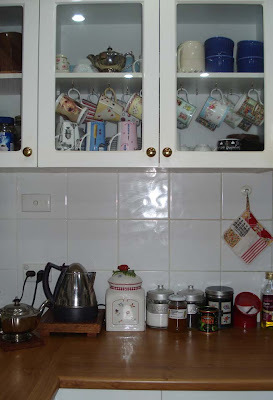 Setting up your kitchen according to the tasks you carry out each day may help you do your work. If you decided to try this, it would work if you did the entire kitchen in one go, but it would also work if you chose one job, like tea and coffee making, and made a zone for that. When you had more time, you could rearrange other areas into zones for their purpose. You could also rearrange your pantry to have all your baking requirements in the same place. That is my next job - the next time I clean out my pantry, I'm going to place all my regular baking requirements in one area; jars holding chick peas, lentils, beans and rice in one line; the smaller containers of different flours - self raising, plain, gluten, soy, corn and barley flour in another line. At the moment, I have a general idea where everything is, but often I'm moving jars and sealed buckets around to find exactly what I need. And that reminds me, I have just picked up five two litre size, food grade buckets with lids and I need to label them. They were free. :- ) Does anyone know a site were I can download free kitchen labels? When everything is sorted in the way you work, all the tasks you carry out everyday will have the requirements close at hand. Those things you rarely use will be in those hard to get at spaces. My kitchen isn't perfect, for instance I'd like my cutlery drawer to be next to the plate drawer, but it's opposite it. It requires my turning around to get a spoon for stirring on the stove. But I don't worry about the things I can't move, I just move everything as close as possible to the zone it should be in, and am happy with that. I'm sure many of you have already done this but I know there will be many who haven't. So if you decide to give it a try, I hope it works as well for you as it does for me. Let me know if you do any rearranging and if you have a blog and post a picture, give me the link and I'll have a look at your handy work. And just to finish off, I haven't done much square knitting lately because I've been writing a lot, but I will get some done later this week. I am still very interested in my rug, and yours, so how are you going with your knitting? I spent a lovely weekend here with Hanno. Not much happened, there were a few phone calls and little else. Hanno worked on the garden, cleaned out the chook house, Lucy-proofed the garden fence and mowed. I spent most of my time either writing or cooking and a couple of times we sat together on the front porch with our tea, talked and just enjoyed the weather and the scenery. It's been raining on and off most of the weekend, so it was just the right weather for baking. 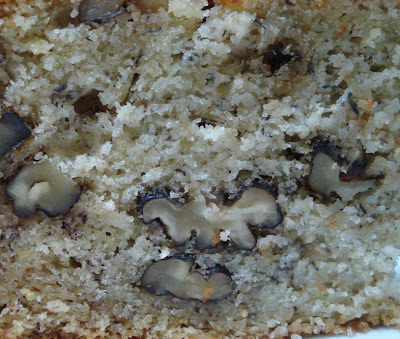 I've been experimenting with a tablespoon of boiling water in my cakes lately and I have to tell you it works a treat, giving a moist cake that will last quite well. Today's recipe is for the best cake I've ever made. Really - it's THE best cake I've ever made. I baked it last weekend, we ate it on Sunday and during the week, having the last piece on Friday. It was still moist and delicious. This is a must try recipe. The only change I made was to use eight bananas - but they were our little Lady Finger bananas, which would have been the equivalent of the three large bananas, mashed, in the recipe. Please try it and let me know. The boiling water trick works in other cakes too - just add it after your cake is mixed and stir in. It gives a moistness you won't have otherwise. 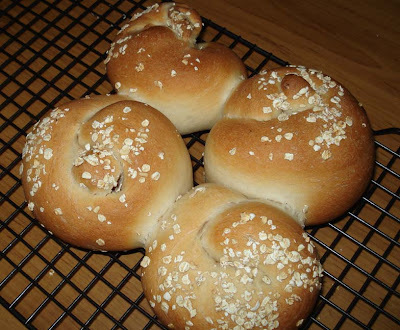 I baked breadrolls on Saturday and Sunday but made the dough for both on Saturday morning. I wanted four rolls on each day, so I made up the recipe below, threw it all in the breadmaker, flour first then everything else on top. I set the machine to the dough setting and when it's done kneading, I divided the dough in two equal portions, placed one in a plastic bag in the fridge. On Saturday our topping was polenta. Can you see the small strand of bread attaching one roll to the next. That the sign of a good dough. And here it is again the following day on our Sunday rolls. 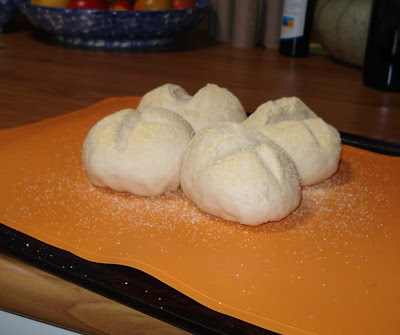 The dough needs to return to room temperature before it will do its second rise. I removed the dough from the fridge at 6 am and it was just ready to bake at 11.30am. 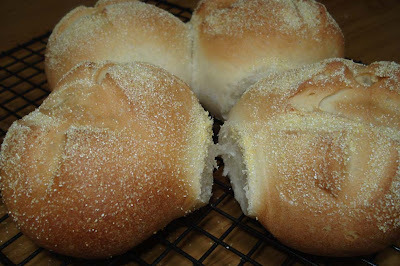 On Sunday I topped the rolls with oatmeal. You will notice in the photo of the uncooked rolls, I'm using a silicone baking mat. I've been using this, on and off, for about 18 months now and it's still working well. It's non-stick, reusable and easy to clean. This is not an advert, I have no idea what brand mine is, but I want you to know there are alternatives to parchment paper that can be reused many times. The amount of water you add will depend on your flour and the weather. If it's humid you'll use less. Learn the feel of good dough. You should feel EVERY dough you make between your fingers. 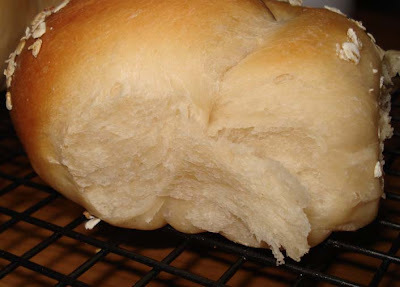 Aim for a moist dough that holds together well, has no areas of dry flour, but is not wet. When you know the feel, you'll be able to judge the amount of water in the dough by the feel of it. Thank you all for the comments and good wishes yesterday. Both Hanno and I read them all. I also want to thank my dear friend Sharon who has worked on Down to Earth with me for a long time now. She just offered her help one day and that was that, we are firm friends now. Sharon is the reason the swaps are still going, she organises them along with Rose now, and Lorraine in the past. Thank you all, ladies. I appreciate your help, it is a real pleasure for me to work with you. When I turned off my computer yesterday, the counter was on 999,934. This morning it had clicked over to 1,001,100. I can't quite believe it! When I first started my blog, in those early days when I wondered about a name, what to write about and if anyone would read, I never for one second, imagined that less than two years later (started May 2007) over a million visits would be registered. I started the blog because I'd written the beginnings of a book on simple living that had been rejected by Australian publishers. I'd earned a living as a writer for a long time and when I got those rejections, and I knew I wouldn't be writing the book, I started this blog so I could continue writing. My hope in those early days was to create a record for us of what we were doing on a day to day basis, and if anyone visited, to encourage them by that example. Well, people did come, they asked questions, made comments and instead of me encouraging the visitors, I was encouraged to continue because of the questions and comments. Along the way I've made many friends, met a handful of you, and all the while been amazed by the extraordinary international blogging community that has built itself from scratch. I have been challenged by the sewing and knitting blogs, affected and motivated by many of your personal blogs and, overall, been encouraged by the knowledge that like minded folk all over the world strive to live in the same simple way Hanno and I do. Blogging has confirmed my belief that the written word is a powerful force. It has given a voice to many of us, who, without the ability to tap away on our keyboards, then press the 'publish', button, would never have our stories read or connect in the way we do. Blogging is a communication revolution in which we ordinary people bypass the restrictions and bias of the print and electronic media and say whatever it is we want to say from our own homes. Gone are the days when we rely on magazines, TV, radio and newspapers for our information, now we print our own little newspapers each day and self-publish into an ever growing community of blog readers. Never underestimate the power of that 'publish' button. I hope my posts help you in your quest for a simple life. I want to encourage you not to copy what we do but be encouraged enough by it to build a life that suits you and your family. My hope is to challenge you to believe that you can change your life because often, our mainstream media want you to remain the same or follow what their advertisers dictate. I am not a change the world sort of blogger because I know we all have to change ourselves before any world change is possible. 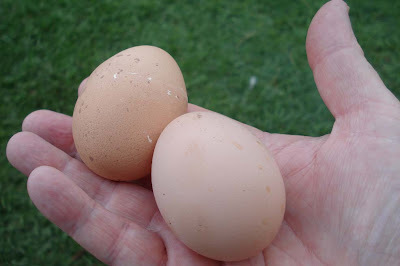 If there is wide spread change in the coming years it will be because backyards are filling with vegetables and chooks, because we are being prudent and selective with our spending and because we expect more and do more for ourselves. I guess my blog has completed a circle in some ways because I am now writing a book because of it. I have a literary agent in New York, who found me through this blog, and will soon sell the north American rights to my book on simple living. You are part of the reason I am writing that book now. If you had not been reading here, if you had not challenged me to keep going by asking your questions and making your comments, I probably would have not kept writing as regularly as I did. So for your part in this blog and that book, I thank you sincerely. We had a feeling there would not be many potatoes in that last lot we planted. Hanno dug them up yesterday and we only had about two kilos (4½ lb) from the entire bed. One end of the potato patch never flowered, the other end had a few flowers and was the area that gave us what we harvested, most of them are small potatoes. It's really disappointing when we prepare a bed, plant seeds and tend the garden to have little return for the effort. We try to live on what we grow in our backyard, it makes up the major part of the organic fruit and vegetables we eat, and when it fails, even if we work out what went wrong, it feels bad. We think we had too much rain and that adversely affected the potato crop. 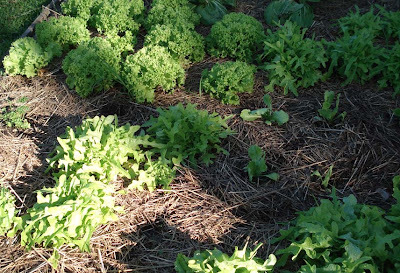 Rain is usually not a problem in our garden, but when it comes to root crops, too much rain over an extended period can rot the crops in the ground. Hanno is preparing another garden bed for our next potato crop. We are also preparing the front garden for the wedding. Hanno has trimmed bushes, weeded the gardens and planted up a few new plants we bought last weekend. It's starting to look really pretty and we hope that by the end of June, the new plants will have grown and there will be a few flowers around, even though it's the middle of winter. Shane and Sarndra are in New Zealand now, working as WWOOFers (willing workers on organic farms) and moving around the country exchanging their labour for four hours a day in exchange for food and a bed. If you read this S & S, I hope you're still enjoying yourselves and meeting nice people. We miss you! I had a comment from Julie M yesterday about our down days. In part Julie writes: "The reason I decided to post today has been on my mind for awhile. Reading everyone's posts breaks any preconceptions that leading a "simple" life is a painless and smooth journey, however no one has ever really given the stories of the "down days." Everyone has bad days, and I would imagine there is a time in this "simple" journey when it'd just be easier to chuck in the towel and give in the the tide of normality. I think what leads me to this query is that, perhaps everyone wants to highlight only the good while minimizing the dirty part of this journey, but surely this lifestyle isn't "perfect" (whatever that is?). We're all human, but I have yet to read any stories of a "bad day"... They do exist, right?" Hi Julie, thanks for your comment. Although I have written a few times about a day not being great, or feeling down, generally our days here are actually very good. I think the common complaint is that we, the people who live this way, are not understood by those around us and are seen as a bit weird. That doesn't bother me, I've never been one to fall in with what my peers are doing, I think I must follow my own path, and usually I don't worry if others think I'm strange. Early on in my journey, before Hanno realised we really could live like this, we had a lot of discussions, sometimes heated ones, about this change and how if would affect us as a family. Even then, I felt we were on the right path and given time Hanno would see that for himself. I wrote about that yesterday and said that didn't make it more difficult, it made it more exciting. Living this way gives you a power you don't have at other times. It's the power to take charge of your life, to learn what you need to know so you can achieve what you need to achieve on any given day. Sure, there is more work and sometimes it's hard and dirty, but it's satisfying work and it makes you feel you've really accomplished something, and that your day had meaning. I never had that feeling when I was spending and living a mainstream life. So even when things go wrong, or you have a down day, overall the prospects still look good so it doesn't impact like it used to. And so much goodness happens, it's difficult to emphasise the occasional bad thing. I haven't helped, have I? Maybe I'm the wrong person to ask. The ladies meet for afternoon tea. Let's see, our potato crop failing has been a downer this week, sometimes I don't feel like writing my blog, but I do it because I know people are reading and, without fail, when I finish writing, I feel better for it. Sometimes I wish we could buy something we need straight away and not have to save up for it, sometimes I'd like to go out for a drive, but I have work to do here at home, and I fuss a bit about using the fuel. But that's it for me. I am generally an optimistic person and not a lot goes wrong. I'm also much more philosophical about life's ups and downs now that I'm in my 60s. I know now that if something is wrong, it won't last, and life will return to 'normal'. I am also grateful to be surrounded by a loving family and friends. That support is always there, appreciated, and reciprocated. It makes a difference. But let's open it up to discussion. How do others feel about Julie's question? Thanks for asking, Julie. I want to point you towards a wonderful post written by Amanda Soule Mama. This week, Amanda wrote about a creative way to organise children. I wish I'd thought of this. It's such great simple idea and I'm sure it would work in the gentlest way while encouraging a work ethic and teaching children how a family works together for the good of all. Thank you all for visiting me this week, and thanks for your lovely comments. I will probably be back over the weekend sometime to mark the millionth visit to Down to Earth. How crazy is that! After receiving a dozen emails in the past day or two about starting a simple life, and having many new readers join us over the month, I thought it was a good time to write about that subject again. So how do you start living simply? The complex answer is to develop a set of simple values you want to live by and fashion your life around those values. The simple answer is that you've probably already started. If you're here looking for encouragement, ideas and motivation, I'm guessing the idea is already in your head, you just need to work out a practical way of developing your idea of simplicity. When I started living this way, I started with myself and my home and I tried to simplify everything I could. I wanted to make my home as comfortable as possible so my family and I felt nurtured just by being at home. I wanted to rid my home of as many chemicals as possible and start cleaning with less harmful 'old-fashioned' products like vinegar, bicarb and soap. 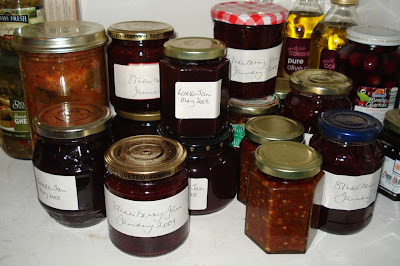 I wanted to stop serving foods containing preservatives and artificial flavourings. I wanted to return to my home in every sense and reskill myself in the arts of the homemaker. I wanted to develop my frugal living skills, cut back and modify how we lived so we wouldn't notice or care that I wasn't working. I wanted to slow down but feel more alive than I ever had. I needed to lose the person I had become while working for a living and rediscover my true self. And I hoped that living a more simple life would help me achieve all those goals. I am happy to report that I was able to do all those things, and much more. It will be a great help to you if your partner and family are working towards simplicity with you, but when you start, you will probably be the only one in your family who thinks it's possible. That's okay! When I started along this path, Hanno thought I'd lost my marbles. And maybe I had because I was going against the tide of everything I'd lived with and believed in the previous 50 years. But that didn't make it difficult, it make it more exciting. I felt I had a real purpose. Now my life was more than working to pay for stuff I didn't need. Now my focus was in creating a good and decent life that would sustain and nourish my family. And I wanted to do that when I had just closed down my business and I had less money than I ever had. Money is not the most important aspect of a simple life but it is the glue that holds it all together. If you don't pay off your debts and cut back on what you buy you'll find it very hard going. So work hard on managing your money. It isn't easy, but it's necessary and I promise you that when you get a handle on your money, when you start paying off those credit cards, and stop shopping for non essentials, your life will open up in many wonderful ways. When you do have to shop, look for bargains, ask for discounts, plan your shopping and try to buy good quality appliances that will last. Look after what you own. Learn how to mend and clean properly so you can make what you have in your home last as long as possible. Look critically at what you do and stop waste. That might be wasted food, fuel, fabric, water, electricity, money or time. Prudent planning and watching what you do will help you minimise waste. Learn how to store food correctly. Never stop learning. Learning new skills will help you in the coming years and whether it's learning how to bake a loaf of decent bread or how to plant a vegetable garden, it will enrich your life and make things easier for you. Pass on your skills to your children. Never limit yourself. Life and the people around you will try to limit you, so limit what you spend but don't limit yourself. Look after yourself, take time for yourself, get enough sleep and slow down. You will get more done. Give to your community. A healthy community will help you thrive, so make sure you give time and effort to help your town/area develop. Give more, expect less and then stand back and watch your life change because of it. I could continue writing much more but this post is getting way too long. So my challenge for you is to decide what it is you will change about your life right now. Don't click out of my blog today and go about your normal activities. I would like you to think for a few minutes about how you could make a simple change that will make a difference to your life. Then I want you to do it. It could be as simple as "I will sweep the floor instead of vacuuming. ", "I will stop procrastinating and will go and plant those tomato seeds right now. ", "I will walk to work. ", "I am going to write up a budget. ", "I will start collecting materials for my compost. ", "I will make morning tea and ask my partner to join me. ", "I will cook tonight's meal from scratch", "I will stop nagging and start encouraging. ", "I will think about what values I want to live by." or "I will spend more time with my family." Whatever it is, whatever commitment you make right now, carry it out as best you can and make it part of how you live from now on. Simple living is never fast, it is a small steps process. But over the months and years to come, by adding one thing at a time, by changing how you see yourself and others, by doing your best, by taking responsibility for yourself, by slowing down and becoming the person you know yourself to be, you will change your life and be happier for it. It's Wednesday morning and once again I'm looking forward to being at home after two days out at work. My work days are getting busier as we move towards the building of a new Centre. We have to equip and furnish the building, having no money, but with access to various grants. The generosity of people never ceases to surprise and please me and just yesterday a man I had know for only 30 minutes donated a brand new leather sofa for us to use in the reception area of our new building. I am ever thankful that what we need seems to be provided by someone, somehow, and even though we have no funds to buy what we need right now, I have no doubt that when we open our doors on the first day, we will want for nothing. Yesterday marked another important day on our way to the new work place - we had a cleansing ceremony on our block of land. 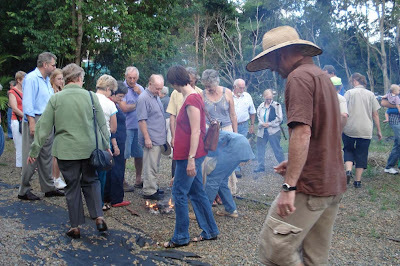 The land was passed from one community group to ours yesterday and we marked that important day with an aboriginal cleansing ceremony, carried out by my good friend, Bev, elder of the local Gubbi Gubbi people. 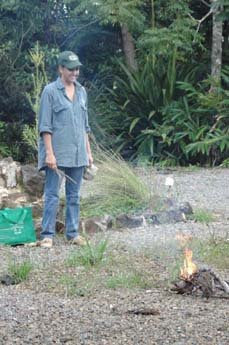 Bev preparing the fire for the smoking ceremony. So now we're back to our current topic of growing vegetables. I've just read through the two previous posts and I hope I haven't made it sound too difficult. With all new skills there is a period of learning and sometimes failing. Many of life's lessons are learnt through trial and error, and this is no exception. It's okay to fail, you learn a lot that way, I least I know I have, but the thing about failing is that you have to try again. So if you have trouble getting seeds to germinate, or they start growing, then die, that is okay, and quite normal when you first start growing your own food. Just keep going, never ever give up. Bit by bit you'll work out what to do and in a few short seasons, you'll be growing crops that will be a regular and healthy addition to your family's table. If you have a short season - either too hot or too cold, try growing baby vegetables, or the smaller varieties of your favourites. I would dearly love to grow savoy cabbages and big white cauliflowers here, but my climate is too warm, so we settled on sugarloaf cabbages and baby cauliflowers. We can grow both of those quite easily. The sugarloaf cabbages don't have the beautiful crinkled leaves of the savoy, but it tastes just fine. And the mini cauliflowers are delicious, we just have to plant more of them spaced a few weeks apart to give us a continuation of supply. You can also buy broccolini, which is a smaller but delicious broccoli, small carrots, small pumpkins and baby squash. 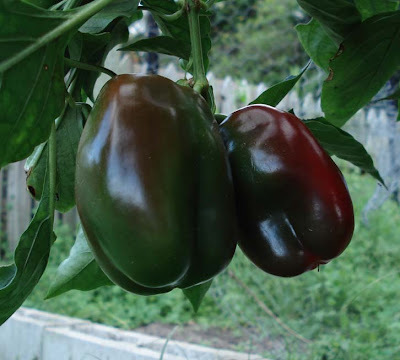 All of them grow to maturity in a shorter time that the regular variety, so even though you have a short season, you might be able to get a few vegetables to harvest. 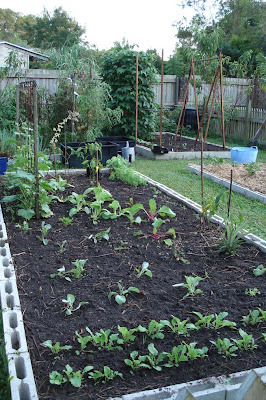 So what do you do if you don't have a backyard or the space to grow vegetables? You can also grow vegies in large containers, like polystyrene boxes and rubbish bins with drainage homes. Any large container would do, and if you have a sunny spot, you could grow one tomato bush, or beans or cucumbers, using the vertical space on your patio, or a row of lettuce , chard or herbs. 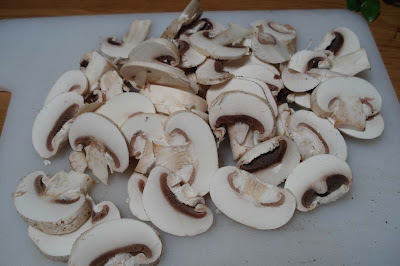 And for those who have no sunny spot, you could grow sprouts or mushrooms inside. I'll do a post on sprouting for you very soon. It's sad to think that many of us have lost the ability to work the land we live on. Some of our pioneering ancestors died for, or suffered extreme hardship, for a parcel of land to live on and grow food. I hope I have encouraged you to use the land you have, to learn the skills you need to work your land and to provide your family with cheap, fresh, organic food from your own backyard. We may not be able to change the world, but we can give it a good try, reclaim our independence and slowly work towards change, one backyard at a time. Happy gardening, everyone. ADDDIT: I have answered the questions asked in the first gardening post. This post continues on from yesterday's. Today's topic is seeds, seedlings and planting them. 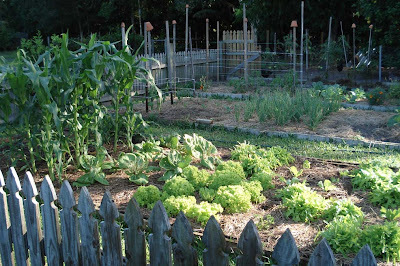 Deciding on what you will grow is one of the exciting parts of gardening. Pouring through catalogues and seed packets at the plant nursery always make me over-estimate how much ground we have and under-estimate our time. You need to be prudent, especially in the first few years of gardening. My advice is to write down a list of what vegetables you're buying and make up your garden list from that. If you're new to gardening, plant the easy things first, then work your way into the more difficult vegetables. These vegetables are easy to grow: beans, peas, tomatoes, squash, pumpkin, cucumber, zucchini (courgettes), corn, lettuce, sugarloaf cabbages, chard, kale, spinach, most herbs, carrots and radishes. If you're in a hot area, luffas, peppers and sweet potato will grow well; if you're in a cooler zone, cauliflowers, onions, broccoli and all types of cabbages will do well. If you're still undecided about what to plant, work out what you're buying, then choose the most expensive vegetables, or the ones you eat the most of. Seeds may be planted out into the garden when the soil is warm enough (you'll find that info on the seed packet), or in trays that can be transplanted when the plant is big enough. Beans and peas and root vegetables like carrots and radishes are best planted directly into the ground because they don't transplant well. You can plant carrots and radishes seeds mixed together. The radish tops will appear within a week, showing you where the carrots and radishes are. When the radishes are ready to harvest, you pull them out and that gives the carrots more room to grow. Most fruiting vegetables - tomatoes, zucchinis, squash, peppers, capsicum, pumpkins etc and leaf vegetables - lettuce, cabbage, kale, chard etc are easily transplanted so those seeds can be planted in trays or pots and raised in a warm place. 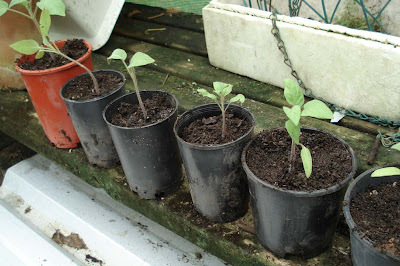 As soon as the soil is warm enough you can transplant an already growing plant, saving the three or four weeks it would take the seed to reach that stage if you planted it straight in the ground. A seed is a self contained unit of nutrients that only needs warmth, moisture and soil to germinate and grow. When you plant your seeds they do not need light or fertiliser to grow. Placing them into soil and watering them gently is enough to make that seed burst into life. When the seed has germinated and has grown the first couple of leaves, it then needs adequate light, moisture and light fertilising to keep it going. Compost tea, comfrey tea or organic liquid fertiliser are all ideal for this task. You make those teas by adding a quarter bucket of either compost or comfrey to a bucket of water. Stir and allow to sit for a day or two, then strain the compost or comfrey out and keep the liquid (the strainings go in the compost). This is then diluted one part tea to six parts water and used on the seedlings after they put on their first few leaves. You plant the seeds according to their size - each seed is planted at double it's size. For instance - if your seed is 1 mm, plant it 2mm deep, or one eight of an inch, plant it one quarter inch deep - so the bigger the seed the deeper it is sown. The instructions for planting seeds are on their packets. 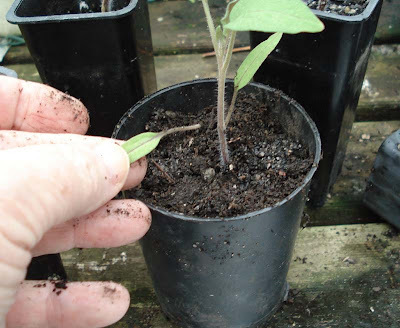 Make sure you plant into clean containers using seed raising mix or your own light blend of garden soil, sand and old compost - is must be well draining and it must not have any lumps that might stop a seed from emerging. When your plants are ready to plant out, plant them at the same level they were growing in the pot or tray. The only exception to this rule is when you plant tomatoes, you remove the bottom set of leaves and plant it deeper than it was growing in the pot. Tomatoes can send out roots from all along the stem, so planting them deeper allows them to grow more roots. More roots = more tomatoes. Plant out into well prepared soil that contains a lot of organic matter. The exception to that rule are carrots - they like a bed that has little compost and no lumps. When you transplant your seedlings, water them in with a weak solution of seaweed concentrate that has been diluted according to the instructions on the pack. This eases transplant shock and will help your plants grow well from the first day. After a week, when you know the plants have settled in well, start your fertilising regime. 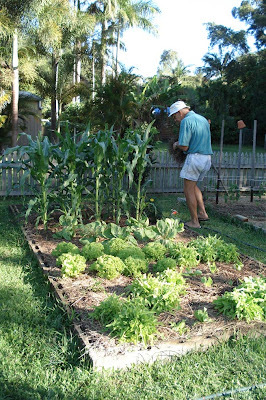 For leaf vegetables (cabbages, lettuce, chard etc) fertilise with a weak liquid organic fertiliser. Dilute it to half the recommendation on the pack, but fertilise every week. For fruiting vegetables (tomatoes, peppers, squash etc) fertilise with the same weak fertiliser you used on your leaves, but do it every two weeks. Fruiting vegetables also need potash - so apply that in the planting hole when you plant, and apply again every four weeks. Potash encourages flowers and fruit so you will get many more tomatoes /squash/pumpkins etc if you use potash. Be careful when you fertilise and know what each one does. 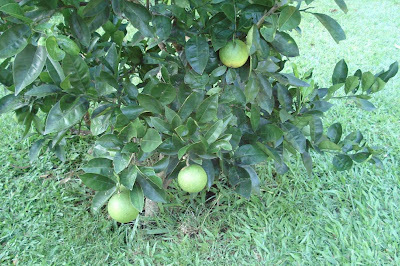 Nitrogen encourages green growth at the expense of fruit. 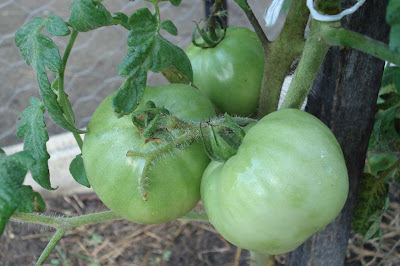 If you apply too much nitrogen to a fruiting plant, like a tomato or squash, you will get a beautiful green bush with very few tomatoes or squash. I am a bit pressed for time today, so I'll come back to this tomorrow and answer some of your questions then too. If you know of a good planting guide for north America, please let me know. Planting guide for Australia, NZ and UK - choose from the drop down menu at top. 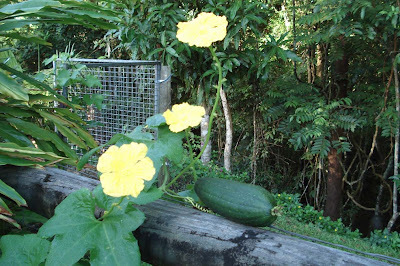 Vegetable planting guide Australia - Eden Seeds. Articles on various common vegetables. I was delighted to see Michelle Obama on the news yesterday planning an organic vegetable garden for the White House. I really like how the Obamas learn valuable lessons from people who stood in their stead well before them, notably Abraham Lincoln and the Roosevelts, and even when they could easily afford to buy organic produce in the White House, they choose to grow it themselves. It is a wonderful and valuable example they're setting for their children and their nation. Many of you know we grow food in our backyard all year long, but we wind down at the end of summer, which we've just passed through, and rejuvenate the beds before planting out for the new season. March is our main planting time. What we plant now will do us through until about November and as we eat our way through it, we'll plant patches of fill in plants to help us with our aim of self reliance. Our days are busy with planning and planting so today I thought I'd post about how to get a garden started. This is a very long subject so I think it will probably spill over into another post. There are a couple of things you need to think about before you start - like how much time do you have to spend in the garden? and what will you grow? Know this - a garden will cost money to start, and time and effort to keep going. If you can't, or won't, put the time into it, you'd be better off looking for a source of cheap organic vegetables close to your home. But let's say you want to try your hand at gardening, how do you start? The first thing is to check the soil where your garden will be located. If it's an old cow pasture you probably have the best site possible, but if you want to grow vegetables in soil that's never grown anything before, and it's clay, sand or rocky, you'll have a lot of work to do before you start planting. To see what kind of soil you have, wet some soil, scoop it out into your hand and roll it into a sausage shape. If the sausage stays firm and doesn't fall apart, you've probably got clay. If the sausage won't hold its shape, you probably have sandy soil. If it holds its shape but as you roll it in the palm of your hand, it breaks apart slightly, it's probably good loam, the best of all soils. The solution to problem soils is to add compost. It helps clay soil and sandy soil. If you have rocks, you'll have to dig them out. Let me be very clear here. If you have poor soil, you'll have to enrich it. You will waste your time and the money you spend on seeds or seedlings if you plant into poor soil. My how to make compost post is here. To grow organic vegetables, you need to grow your plants naturally, using no artificial fertilisers, wetting agents or chemicals. If your garden beds have timber edges, it must be non-treated timber. Your soil will also need to be full of organic matter - this retains the moisture, encourages worms and will give the soil a much better structure. You add organic matter to the soil with compost - the decomposed remains of your lawn clippings mixed with your kitchen scraps, paper and garden waste. A useful side benefit of gardening is that it will help you recycle a lot of that waste you used to put in the rubbish bin. 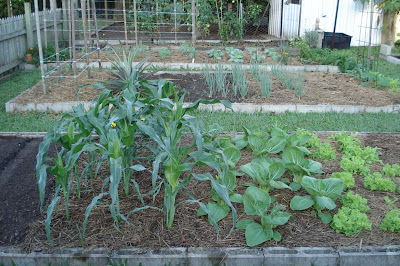 While we see vegetable gardening as a very natural pastime, you would never see the assortment of vegetables that are commonly grown in a backyard growing naturally side by side in nature. To do that, you have to give them good conditions and continue to look after them. So after you plant your seeds and seedlings, you will have to give them some time during the week to look after them and water them. And please consider your seasons and the time of season you grow. No matter how much you want it to grow, planting a pineapple into ground that has been snowed on, will not give you a fresh pineapple. I would dearly love to grow apricots here but I know the limitations of my climate, and I leave them to those gardeners who are in a colder climate. Also, planting corn late in the season will give you a corn plant, but no corn because it won't have enough time to grow the plant and the cobs. So be guided by the times on the seed packets or on the seedling pack. Apart from good soil, seeds, seedlings, compost and natural fertilisers, you'll also need tools. If you intend to dig, you'll need a spade and maybe a fork, you'll also need a rake and a trowel. None of these tools needs to be new. You can buy perfectly good tools from the secondhand store or at markets and often the older tools are very good quality, they just need a clean up. 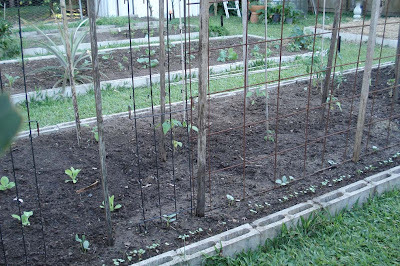 If you want to grow climbing vegetables like beans, peas, tomatoes, cucumbers etc, you'll need stakes and climbing frames. Again, you can probably pick these up from your dump shop or secondhand store. Check out your garden in the morning and evening and see where the sun rises and sets. Your vegetables will need between six to eight hours of full sun per day, except if you're in the tropics, then you'll probably be looking for a bit of afternoon shade or a shade tunnel. Don't plant your garden over the roots of large trees - the tree will rob you of the moisture and you won't have the success you deserve. 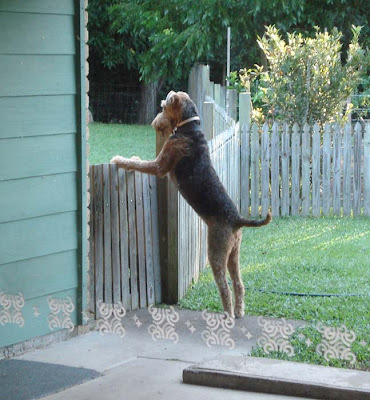 If possible your garden should be fairly close to the house, close to a tap and if you have dogs or chooks, you'll need to fence it off. We dig. We've tried no dig gardens in the past but they never produce the quality of food we get when we dig. We use slight raised beds that we dig and add compost and manure to year round, particularly just before our big plant out in March and when we plant anything new. Draw your garden plan on a piece of paper, making sure that the taller plants like corn and tomatoes don't stop the sun reaching the shorter ones nearby. You'll need to walk around the area you plan to dig and make sure the plan you've drawn will work. Don't make your gardens too big because you don't want to be walking on them. You're better off making long, narrow gardens that can be accessed from both sides. I hope I haven't scared you off but I do want you to know that vegetable gardening is not a walk in the park. It's wonderfully enriching, it's good exercise, will give you cheap, fresh, organic produce, it's madly entertaining and productive, it's will help you on your way towards independent and self reliant living, but some of it is hard work. Know, really know, that you'll be able to carry if off before you start. If you don't think you can construct garden beds and dig, ask someone in your family to help, or see if there is a teenage boy in the neighbourhood who will do the hard work for you for a few dollars. Having the ability to grow some of your own food is empowering and it's a great skill to pass on to your children. 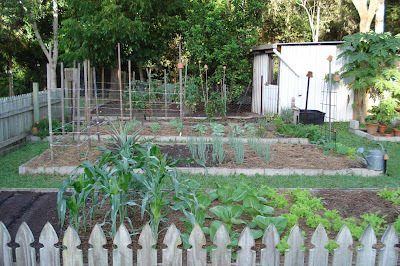 If this is your first garden, start with a small crop and add a few more things each year until your garden gives you what you would usually buy. If you're unsure about how you will cope with a garden, and if you're young and fit, challenge yourself, and work slowly towards it. It is hard work, particularly starting the garden from scratch, but if you can do this, if you decide that a bit of hard work will be good for you, if you step up to the challenge and work through the season to its end, you will harvest more than vegetables. Your bounty will include satisfaction, knowledge, independence and the ability to produce food from a seed. And that, my friends, is a skill worth having. Tomorrow I'll write about seeds and seedlings and how to plant them. We've all wanted her to return. That icon of the fifties, the housewife in the Audrey Hepburn dress and frilly apron who had perfect lipstick and a hot meal waiting for her man. Well, it looks like she's back, but she's changed a lot. Now our homemaker is dressed in jeans and a T shirt, a long linen skirt, or pretty dress. The apron is still there, it might even be "vintage", purchased on eBay for a price we would have laughed at back then, but apart from the apron and the kids, our modern homemaker is nothing like her 1950s counterpart. In the 1950s, housewives were looking for convenience and Laminex, and were embracing plastic. Now we are getting back to basics, going green and reskilling ourselves. Convenience has been replaced by authenticity. Today's homemaker lives with increasing prices in an international economic crisis. She lives in a world of sharp contrasts - on the one hand she has the internet to connect with others, learn her craft and reskill herself, but that same technology also brings danger into her home in the form of scammers, paedophiles and conmen. She lives with the convenience of mobile phones, but also their cost and proliferation into the lives of our young children. She lives in a world of man-made antibiotics, chemicals and preservatives that are added to our foods and drinks, but some of those antibiotics and chemicals have reduced common illnesses and virtually eliminated some diseases. She also lives in a world that gives little respect to the role of the homemaker, while courting her to spend her money in this store or that. Nowadays, women are returning to their homes for a number of reasons. They may have decided to raise their family and not return to work, they may have lost their job and realised they can add to their family's health and well being by working in a more frugal home. There are also all those women who I include in this huge shift in thinking - working women who must go out to work but who know the true value of the home and dive into it head first in the evenings and on the weekends. Altogther, we are the women who will change the face of homemaking in the coming years. I am proud of the work I do in my community, I am equally proud of the work I do here at home. Working side by side with Hanno, we have created a life that enriches us and allows us to live with independence and freedom. We are independent in that we know how to look after ourselves, to grow food and make a comfortable home, and we are free in that we owe no debt. And there are many people who look at us and say how much they admire what we do and wish to do the same, but if truth be told, we are just enacting the role of the homemaker where we make do, repair, cook, bake and clean, using what some might see as old-fashioned techniques, but within a modern context. Big deal, we are doing what our grandmas used to do. There is nothing new in this. But maybe the pride in doing it is new. I want to encourage all of you, whether you are just starting on this path or have been on it longer than I have, to take pride in your work and to support other women who are homemakers. The work we do in our homes is significant and vital, not only for our selves and our families but for the nation. I hope you all know how important you are in your own homes. Take back your power to look after yourself and your home. Use the power of your hard earned dollars to support your family and the local businesses you believe give you the best value for money. Complain when you don't get good service and prices and tell that store manager you will take your business elsewhere. They might pretend to ignore you, but a business who doesn't take their customers seriously doesn't last too long. If things don't change, shop somewhere else, then tell your friends. The power of the dollar is an incredible force and we homemakers do most of the buying for our homes, let's use the power we have. Now, more than ever, it is vital that we get value for our money. We need to help our families through this crisis by cutting back as much as we can. We have to learn new skills to do that and we have to learn how to shop for food in innovative ways that stretch our dollars. You are your family's role model right now, it is up to you to show your family that personal growth is possible at such a time and the days of buying whatever you want are behind you. Thrift is back. Let us welcome the happy homemaker. The move is on to make our homes a haven from the stresses of the world, take control of your life, change how you look at housework and look to the future with knowledge that whatever effort and energy you put into your home will be returned to you, plus some. Sure, nothing is good all the time, you will have bad days, I know I do, but the good days should far out number the bad. As modern homemakers we have the power of our shopping dollars, we have the power of our technology, and we can choose to see the work of our homes are challenging, satisfying and enriching. 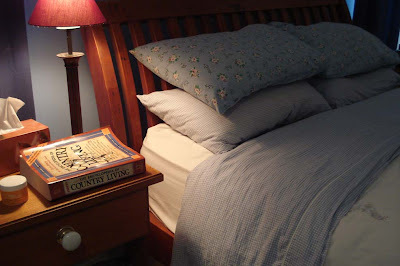 You can make your home a place of contentment and comfort. You can change the way you think of housework and see it as an investment in your family's well being. You will be very influential in seeing your entire family through this economic crisis. What you learn now and what you already know could very well mean make or break for your family. There is a significant job of work to be done here in our homes. We need to plan what we're doing, learn the skills we need to get us through this and work for the good of our families. Let's put our aprons on and begin. 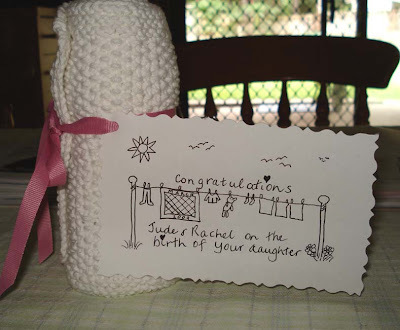 snuggling in, soft and warm, on a cold winter's evening, wrapped in a Shaker-style blanket made by my own hands. I am trying to stay focused on that wonderful thought but now, so early in the project, when I have only seven squares completed, it seems a far off dream. Starting something new, even though you want it very much, seems like too much sometimes. I am enjoying the knitting, it's just I don't have a lot of time for it at the moment. I love that it's small and movable, I love that I can finished a square in a fairly short amount of time, and I love starting and finishing each square. 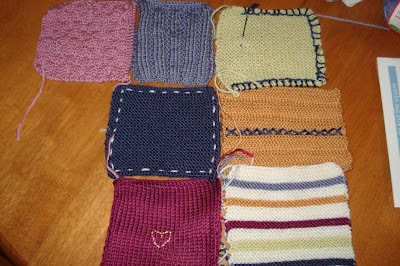 Seeing each square completed and selecting the yarn for the next square gives me the motivation to keep knitting. How is everyone else going on this blanket? Click on photo to enlarge. The pattern featured is a reverse stocking stitch and star square. The square I like the most so far is the mustard one with blue crosses. It is just alternating blocks of plain and purl - I think I did four rows of plain, then four rows of purl. It gives a nice textured look without having to remember what stitch I'm up to. I also like the stripe, so I'll do another of those. But the squares that are the easiest are those in plain stocking stitch. I also like them because I can embroider whatever I like onto them to add interest and I can do them without looking while I talk to someone. I'm guessing there will be quite a few of those. Rows 1 - 4: four plain followed by four purl, repeat to end. Rows 5 - 8: four purl followed by four plain, repeat to end. Repeat these two instructions until you reach the right length. Row 1: Knit into the back of the stitches. Row 2: Purl into the back of the stitches. Repeat Rows 3 & 4 until the last 2 rows. Many thanks for those Rose. It's a big help. I would like to have a photo sharing site where we could all load our photos to show our progress. 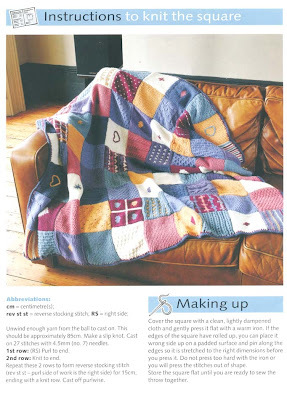 I know this would be a big motivation for me and I think it would help many of our other knitters too. However, I have no clue about where or how. How does Flickr work or is there another site, can anyone help me? It needs to be something I can have a link to on my blog but where everyone who is knitting along can freely load their own photos. 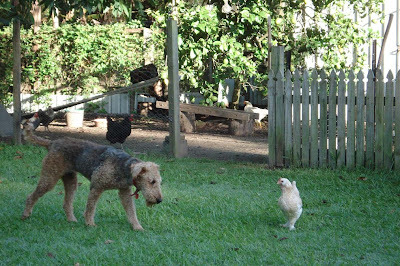 And finally, the photo above is of Koda, watching the chooks. Koda is my step son's dog and we're looking after her while he and Cathy are away for the week. 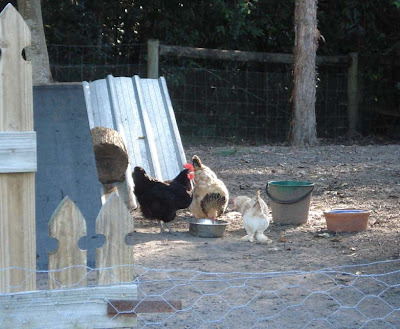 So with Koda and Alice, Princess - Shane and Sarndra's cat and Hettie, our cat, with all the chooks, including Shane and Sarndra's chooks, the old homestead is turning into quite the animal refuge. It's nice having them here though, although Hanno reckons we should put up a sign now saying: FULL HOUSE. Putting nutritious food on the kitchen table is one of the tasks a homemaker must repeat every day. I cringe when I think of the many times I asked my mum "What's for tea?". That's the Australian way of asking what we would be eating for dinner that night. Both my mother and father were very good cooks and it wasn't a problem for them to cook whatever we wanted. The difficult part was deciding what to cook, doing it every day of the year, and making it nutritious, tasty and cost effective. My mother's answer to my constant question was "What would you like?" and I'm pretty sure I always said I didn't care. Of course, my mother was trying to get some ideas for that night's meal, but I didn't make her job any easier with my answers. I rarely asked my children what they'd like for dinner, except when it was their birthday, then they could choose their favourite dinner and whatever it was, I'd put it on the table. Now there is just Hanno and I and I try to cook meals that combine ingredients from the backyard with those from the pantry. This post will document one day last week and I hope to give an accurate costing of the food I served. 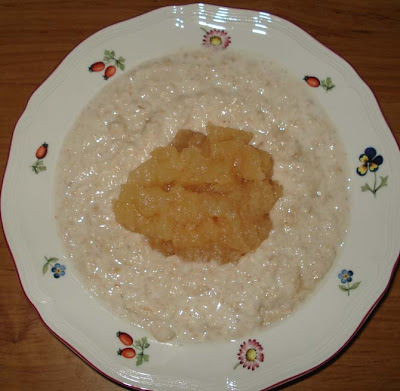 Porridge (oatmeal) soaked overnight and cooked with half water, half milk, served with some stewed apples, and black tea. Cost: about 55 cents. Pikelets with homemade jam, and tea. Cost: about 40 cents. 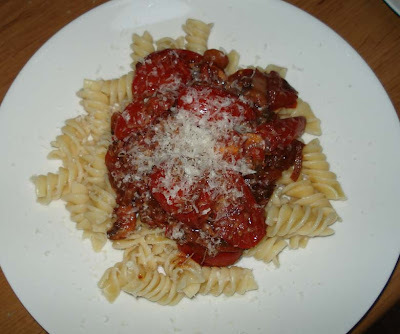 Pasta with fresh tomato and mushroom sauce. 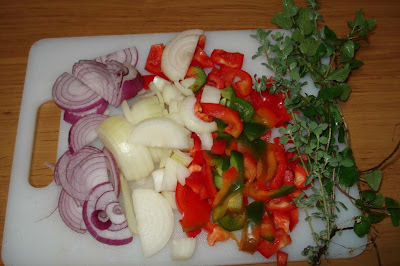 Cut up two onions, a capsicum (pepper), crush garlic and add it to a fry pan with a little olive oil. Season with salt and pepper while you cook. Seasoning your food with salt, pepper, spices or herbs makes the world of difference to a meal, particularly those with no meat or fish. Please find yourself some good salt - I cringe when I see table salt in a home. It's got anti-caking agents and who knows what else in it, when all you need is pure sea salt. Now, that can cost you an arm and a leg but it's also what old fashioned cooking salt is - it's just pure sea salt. I use the Australian brand Olssons and have always been happy with it. Learning how to season food during the cooking of it is one skill all good cooks need. 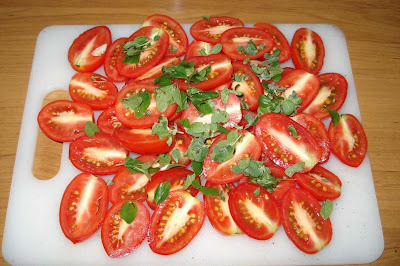 Add plenty of tomatoes and herbs - I used what I have growing in the garden, oregano and marjoram. Stir the ingredients in a pan and add a small amount - ¼ teaspoon (at the most) of sugar. This will take the acid taste from tomatoes that are not home grown. You are not wanting to add sweetness. 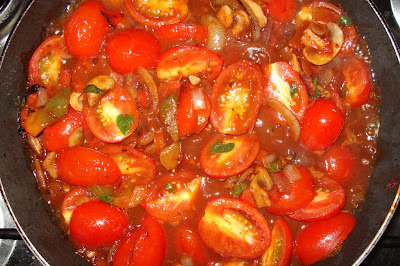 Cook on a low heat for about 20 minutes - or until the tomatoes start to break down. Then pour over cooked pasta and add grated Parmesan cheese. Cost: about $4. Fruit salad and yoghurt. Cost: about $3. I slightly over estimated the cost of my ingredients and it comes out to $9.15. So on that day, from morning to night, it cost $18.30 to feed both Hanno and I. This is the most expensive time of the year for us with our food because we have very few vegetables ready for the table. As the year progresses, the cost of feeding us goes down, due to what we grow in the backyard. This is a major challenge for us homemakers. Not only do we have to feed our families healthy meals they'll actually eat, but it also needs to be done within the confines of our budgets. And sometimes that's a hard task. I tend to make traditional home cooked meals and although I used to add interesting new recipes to my rotation in the past, I'm over that and now cook our favourite meals. We have enough of them to provide a variety of tastes and keep it interesting. If you're trying to cut back on your home costs, food is a great place to start. But you have to develop a good range of wholesome cheap meals your family will eat - that, my friends, is the challenge. Putting those meals on the table that you know they love, but with a cost that won't break your budget is a task we all need to work on, but when you get it right, it makes a real difference. It's easy to barbecue a steak or roast some beef, add a side dish and you know they'll eat it. It's more difficult when you need to concentrate on cheaper cuts of meat or fish - or no meat at all. The recipes are out there, and there are many cheap recipes here on my blog, it's up to you to find those recipes your family might enjoy, test them at meal times, then, if they're a success, add them to your meal rotation. I'd be happy for any of you to share a particular family favourite in the comments. We might find some new favourites from something that is shared here. I'll be back soon to answer the questions from the previous two days. Thank you for the sweet and generous comments and welcome to the newcomers. Clicking on these photos will enlarge them. Autumn, that most favoured of all the seasons, is here, and in my neck of the woods, that means it's growing season. I live in the subtropics, and while Winter temperatures do sometimes drop to zero degrees C at night, the days are usually warm with clear blue skies. March marks the beginning of our new gardening season. We pull out all of summers old crops, build up the soils again with home made compost, manures, worm castings and blood and bone, and start again from scratch. It's a great time of year. The garden is slowly taking shape. Hanno has planted his crops in small stands of neat rows. Not everything is in yet but it's getting there. On the other side of the garden there is a full garden of potatoes and one empty bed that will be planted up entirely with kale. So let me take you on a visit through my garden to show you what else we're growing this year. We have four types of tomatoes - the one above is an oxheart, and soon it will be pulled out, but we've also planted Brandywines, Amish paste and Moneymaker. Three different tomatoes for three different uses. The Brandywines for sandwiches, the Amish paste for cooking and the Moneymakers for salads. We also have cherry tomatoes coming up all over the place. Tommy Toe cherry grows wild here and we generally pull then out when we see them, otherwise they take over. 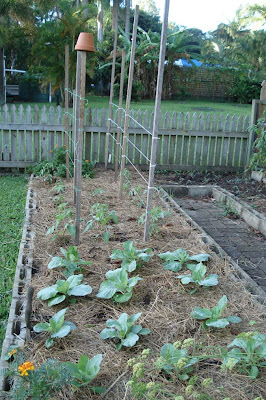 In the photo above we have the newly planted tomatoes at the far end, with sugar loaf cabbages at the front. You can also see a flowering parsley plant that is almost ready to have its seeds collected, and a marigold. While I don't particularly like marigolds, we plant them as a safeguard against nematodes. Flowers play an important role in an organic garden because they attract beneficial insects and some are useful companions. When all the vegetables are in, I'll plant some low growing daisies, in little pockets here and there, and maybe some cosmos or evening primrose. 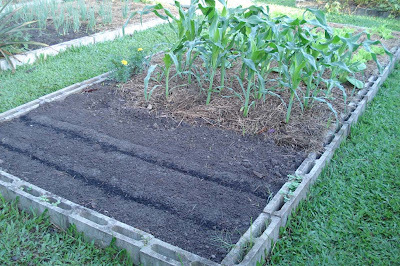 Here we have a patch in which parsnips seeds have been sown, then corn, bok choi and a lot of lettuce. We are concentrating on red and brown onions and leeks this year. 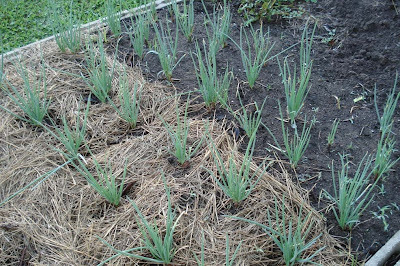 We've had trouble with onions in the past, but we'll plant them again, with leeks, and maybe some garlic, and hope they grow as well as these green onions, which are perennial Welsh onions. This lot have been going for about five years. We also grow fruit. 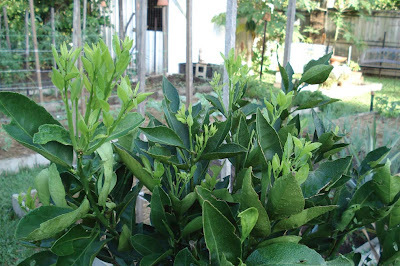 Here we have one orange tree (Washington Navel) putting on new growth on one side of the garden, and below, a dwarf navel with ripening oranges. The orange above was pruned earlier in the year, so we know we won't get fruit on it this season but we thought the sacrifice worth it as the tree now looks so healthy. There is time enough for fruit next year. 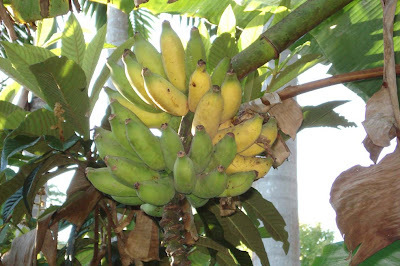 These bananas were picked just after I took this photo and quite a few of them are now in the kitchen. 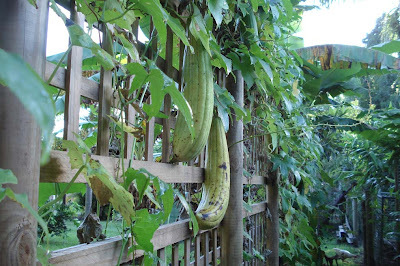 Just next to the bananas, we have a lattice full of loofas, although one vine has managed to leap over to the back fence and grow its fruit on top of the fence where the sun will hit it most of the day. Clever plant. And here below are the lattice loofas almost ready for harvest. 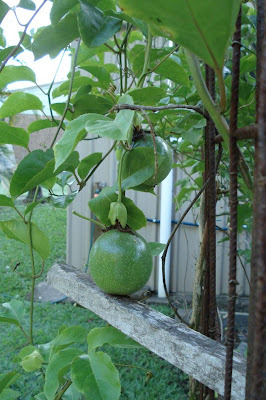 Further over again, passionfruit are growing. We have several vines, these are on the large water tank, just behind the shed. When I see them growing in their green and luscious glory I always think it would be a good idea to make passionfruit butter or cordial, but the truth is we usually eat all of them fresh, straight off the vine, cut in half and scooped out with a spoon. And just because they followed me all over the backyard while I took my photos, here are Alice and Heather. Heather is a little salmon coloured Faverolles chicken, complete with feathered trousers and a fluffy, puffy face. She's a bossy boots, even though she's probably the smallest of our chooks, she keeps the others on their toes. No doubt I'll do updates on the garden as it grows, but now it's at my favourite stage - full of promise, healthy and not one grasshopper in sight. I read somewhere recently there has been a huge increase in the sale of vegetable seeds this year. That tells me that a lot more people are taking responsibility for their own food and will try their hand at vegetable gardening. Which brings us all back closer to where we should be - eating fresh vegetables and fruit and looking after ourselves. So if you're a new gardener, I hope you enjoy your garden, learn more than you ever thought you would and reap a bountiful harvest. Happy gardening, everyone. My friend Bernadette called in on Friday afternoon and while we sat, talking, on the front verandah something caught my eye. I looked to the road and a bunch of pink balloons was making it's way along the street. Our next door neighbour on one side, Angie, was taking the balloons to our next door neighbours on the other side, Rachel and Jude. Their baby had been born! We sat talking about Jayda's fast arrival (they got to the hospital with only 15 minutes to spare), and all the while I held that beautiful baby girl she slept, made funny faces and reminded me, once again, that new life always brings with it such potential. I wondered how the world would change in Jayda's lifetime and made a silent wish that she would live a long and happy life surrounded by family and friends. I will be over 80 when Jayda is old enough to leave home and if she is still living next door to us then I'm sure I'll remember the day I first held her. It was my step-son Jens' birthday on Saturday. He and his wife Cathy live on the other side of our town, so early Saturday morning I made him a birthday cake. Cathy was at work so when we arrived Jens made us a cup of tea, sliced the cake and we had a lovely visit with him. 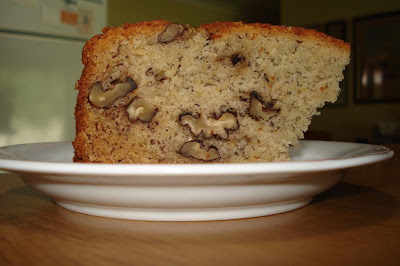 Hanno asked me to make him the same cake, and I have to admit is was delicious, so I'll share the recipe with you. 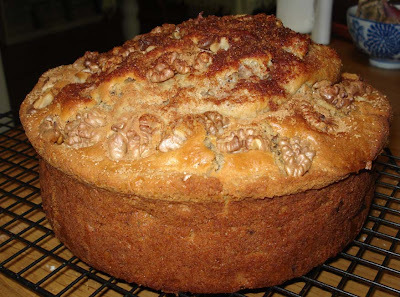 I wanted to use some of the walnuts Hanno cracked last week and as Jens loves apple cake, I combined the two. 4 cups self raising flour OR 4 cups plain flour + 4 teaspoons of baking powder. 1 cup of brown sugar - the recipe called for a cup of brown sugar and a cup of white sugar but I thought that was too much. I only used the cup of brown. If you like very sweet cake, add the second cup. Mix the wet ingredients together and add them to the dry ingredients. Turn on the mixer and start mixing. You will probably need to add more milk, but mix the batter first before you add it. The amount of milk you need will depend on the weather and your flour. You want a well mixed batter, firmish but not too runny. Mix for about two minutes. When you're happy with the batter, add 1 cup of crushed walnuts and 1 cup of pre-stewed OR canned apples and mix them in with your spoon or spatula. Then add the batter to a well greased and lined cake tin. Cook in a medium oven 175C (350F) until golden brown and a toothpick or skewer comes out clean. While the cake is still hot, brush the top with a small amount of butter and sprinkle on a mixture of ½ teaspoon cinnamon and ½ teaspoon of white sugar. When I make this cake for Hanno, I'm going to use butter instead of oil. I think it would also be great using bananas instead of apples. The rest of our weekend was quiet, taken up with gentle chores, chasing chickens, knitting, writing, gardening and cups of tea on the front verandah. The vegetable garden is beginning to take shape and once again I can see the potential of it to feed us for another year. The soil is teaming with life, seedlings have been planted, natural fertilisers added and the plants are slowly taking on their own life. Thank you Hanno for all that work. I'll take some photos and do a post about it during the week. I'm at work today and tomorrow and I look forward to all that will bring. I have a couple of meetings first up with some interesting people, a committee meeting later this afternoon and a meeting with politicians tomorrow (there's an election on). In between all that a million other things will happen. It makes me feel good to be part of such a vibrant and wonderful community. I hope you make your week all it can be. It seems to be agreed now, we are headed for a few shaky years ahead. Some are saying it will be the same or worse than the Great Depression, but the truth is no one knows what will happen. Some people feel secure because they have superannuation/401k plans, or stocks, but another stock market crash might wipe a lot of the value from those investments. Our governments are trying to keep us calm by offering stimulus cheques. They want us to spend those stimulus cheques on TVs, cars and other products they believe will help boost the economy. I hope anyone who gets one of these payments uses it to build a grocery stockpile, buy vegetable seeds, fruit trees and chooks, or build an organic garden, because no matter what happens, we all know we have to keep food on the table. In hard economic times, the real currency is life skills. I'm not sure if our economic conditions now are the same as they were during the Great Depression (GD); my parents lived through it, I didn't, but I do know that almost everything else is different. During the GD almost all women knew how to cook from scratch, make do, substitute ingredients, sew, knit, mend and live without electricity. Now very few do. During the GD, most men could do the repairs in the home, repair a bicycle, hunt, barter, kill and pluck a chicken or skin a rabbit, and would walk miles for a day of paid work. Now very few do. Most families then didn't have cars, no one had credit cards, there were no TVs or computers. The debt ordinary people carried in the GD were mortgages, other kinds of debt were uncommon. During the Great Depression people were equipped to look after themselves using the life skills most people had then, now those skills are lost to many. They used to support each other, their extended family and the neighbourhood. If the economic conditions are the same now as in the GD, everything else is different. If I were a young wife now, with children to raise, I would be learning everything I could about how to do the work in my home without modern appliances. I would learn to make bread by hand - good bread not just a get-by loaf; I would work out easy ways to do the family laundry - in case a time came when I didn't want to use electricity - once I worked it out, I'd go back to my washing machine; I would create a stockpile of groceries, and if I had a backyard I would learn to garden and raise chickens. I would teach myself to sew and knit. I would start mending clothes, I'd recycle and reuse everything I could. I'd start cooking from scratch with the intention of learning how to produce the most delicious and nutritious meals for the lowest cost. If I were a young wife and mother now, I would take it upon myself to save every penny I could to pay off our debt. I would encourage my husband and children to economise, make do and learn to go without. My focus would be on the long-term health and prosperity of my family and I would hope to teach myself enough to give us the best chance in this tough economic climate. It is often thought that the person who goes out to work has the important job in the family and will be the deciding factor in how well the family lives. And while that bread winner role is still vitally important, the stay at home partner is equally important. It is the person in the home who will feed the family, manage the money and pinch every penny until it hurts. It is an exciting time for homemakers. Our jobs have always been significant, more so than we were ever given credit for, but now we have the added responsibility of stretching our dollars to get the maximum value from them and helping our family get through the next few years while who knows what will happen. And if we come out of this quickly and unscathed, well, we'll have those skills to help us in the future. It's a win/win situation. And, as always, I'm happy to answer your questions. I'm looking forward to a restful weekend, full of knitting and a little writing. For all the knitters in the knit-along, I've just finished my fifth square. I'll take some photos and show them on Monday. I hope you enjoy your weekend and have the chance to relax and unwind. Welcome to the new readers who arrived this week. Please drop a comment and say hello. Thank you for all the kind and generous comments left during the week. Take care, everyone. Caution is in the wind. We're being advised to save our resources, spend our money - for the good of the national economy, and keep our heads down. Keep working, keep spending and don't change anything. Times will get better, they say. Of course, times will get better but now is the perfect time to change. Change can make your life better while the bad times continue around you. 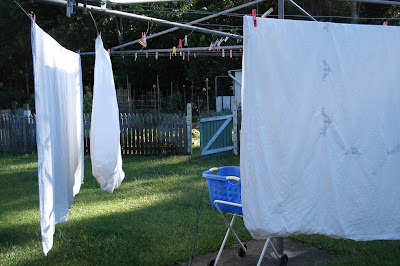 Simplifying your life can make a big difference to how you survive this economic crisis. I'm not saying you should pack up and move to the country, I'm saying that whatever you're doing in your home right now - the way you shop, the way you cook and clean, the way you furnish your home, how you feed your pets, how you think, how you travel to work or school can all be simplified in a way to save you money and eventually, time. Living simply is a good way to live all the time, not just in hard times. I know many people are coming to it now because it provides an optimistic direction and a light in the window in these cold dark times, but even when the economy turns around again, it will provide that, and more. Simple living is not just about being prudent with money, it provides a gentler way of living that is kinder to the environment and to the people who live it than the way we have come to live our lives now. Modern life encourages us to be dependent on others. We buy our food, often already cooked, from a shop, we buy our clothes already made, we have someone cut our hair and 'do' our nails, we go to the doctor to ask what is wrong with us, a mechanic fixes our car, a train takes us on our journeys, someone teaches our children, magazines and TV tell us what we should wear and who we should look like; advertising dictates, products dominate, others decide. Obviously we shouldn't give up the convenience of modern life, but we should get back our independence. We should make our own decisions on food, cleaning, clothing, health and how we live. Almost everything you make yourself will be superior to what you buy in a shop. You will take care that what you include in what you make is healthy and not there just to extend the shelf life or make it smell better. Preservatives and flavour enhancers are there to benefit the manufacturers, not us. We do better with fresh, or home made. This post is not meant to teach you what you might need to know but rather to encourage you towards change. I have written many posts on ways of doing things, recipes, developing yourself and becoming independent. Some older posts on these ideas are here, here, here, here and here. And read 50 simple things, which is here. I don't expect anyone to change their life overnight. It's a slow process, one thing at a time, day-to-day kind of change. But generally you will find that changing one thing will lead seamlessly to other changes and before you know it your life change is underway. And I don't want to point you in one direction either - this life is different for all of us. Those older and younger, with and without children, working outside the home and working at home will all have different priorities and needs. So the point of this post is to help you think about change, to tell you it's possible no matter what you hear from others, and to encourage you to start. You don't have to live your life the way "normal" life is portrayed on TV or in magazines. Your life will be different to your friends lives, so don't model yourself on them. You and your family are unique, so create a unique life and piece-by-piece, slowly but surely, new possibilities will open up before you. It won't be easy, you'll work harder at first, but the rewards will be there for the taking. So wake up, dive in, be bold, find beauty, slow down, give more, expect less, breathe deeply, take pride, value yourself, respect your work, do good, learn, grow, develop, lead, teach and become your true self, whatever that may be. Unravel the mystery of what your life can become by starting on that journey today. That first step is the hardest, but it's also the most important.